A New Region 100% Frenchy! 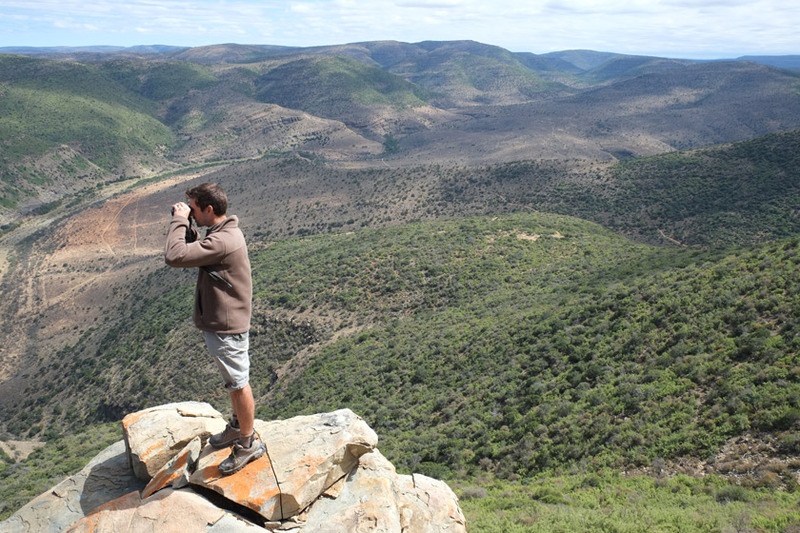 Inwent-Iij: Luc Escoute, you’ve come to take on an area of hunting in South Africa, Koedoeskop, can you tell us about this beautiful project? Luc Escoute: I grew up and worked in Africa for more than 20 years. Lovers of nature and hunting, we wanted, with my two associated, French also, to open a territory of great African game to beginner hunters as well as experienced, in a totally unspoilt environment. 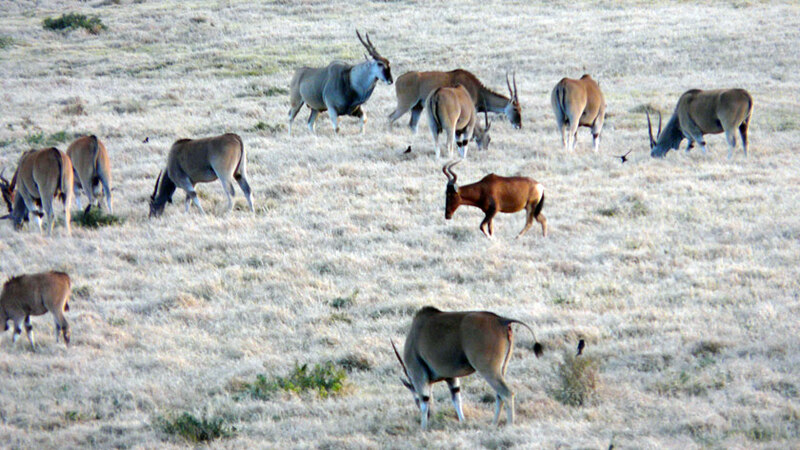 The field of Koedoeskop, [kuduskop], literally, in Afrikaans, “the Hill with Kudus”, acquired in early 2014, has not been used in a commercial manner for nearly 15 years which explains its exceptional diversity (and quantity) of game. The most important thing for us is to offer an authentic African hunting experience, as close to the wild life as possible. Despite the substantial size of the area (3600ha) we favor above all a sports hunting, without locationing or terrain vehicles. Unusually for a domain of southern Africa, we have several distinct habitats: wide river bed surrounded by acacias, bushland, hills and mountains with dense vegetation, each with their flora and their specific game. We do not want to make Koedoeskop a “factory-to-hunt” and only accommodate a few groups per year, in order to preserve the wilderness character. Inwent-Iij: Where is your domain and what are the animals that it is possible to hunt there? Luc Escoute: Koedoeskop is located in South Africa, in the province of the Eastern Cape, 2 hours drive north of Port Elizabeth. 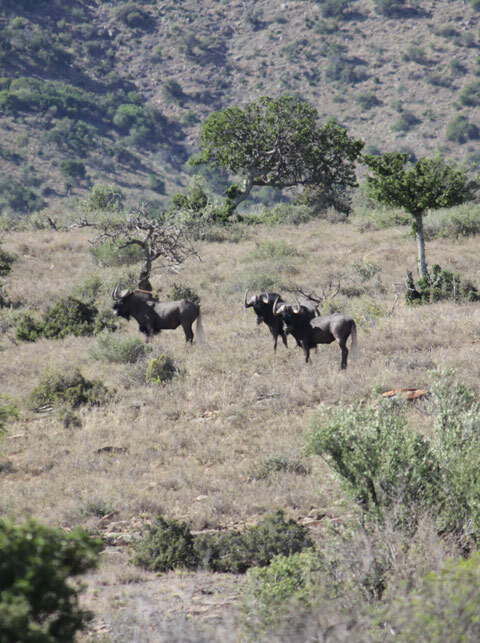 This province is internationally renowned for its Great Mountain Kudu hunting, as well as for the Buffalo and the black wildebeest (white-tailed), endemic game of this province, while offering the advantage of a very healthy zone without malaria and bilharzia. It is also a region largely untouched by the “foot & mouth disease” that affects many South African territories of big game. The large Kudu, Cape Moose and black wildebeest are therefore our flagship species along with the Waterbuck, present in large numbers, because of our river. Many other species are also available: Impala, Springbok, Cobe in the mountains, hartebeest, Nyala, hartebeest in Front white, Steenbok, cephalopod of Grimm and of course Warthogs! Only our population of Oryx is currently too limited to offer for hunting in 2015 – 16. 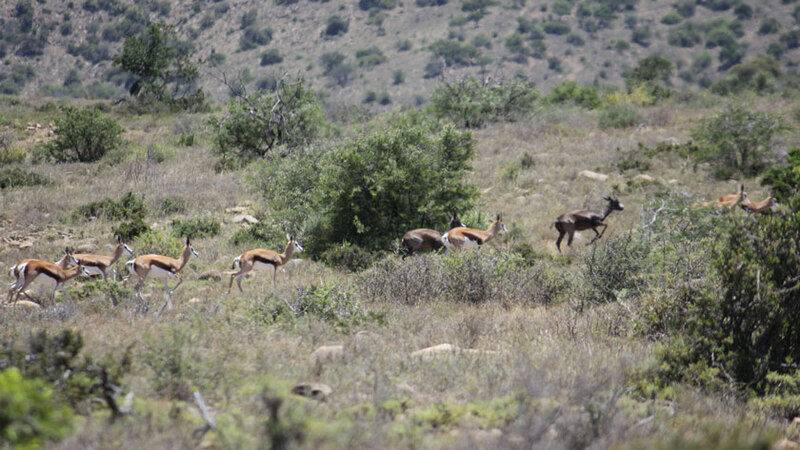 Finally, we have a few Black Springboks , a natural genetic anomaly, a rare trophy. Inwent-Iij: What forms of hunting do you offer to your customers? 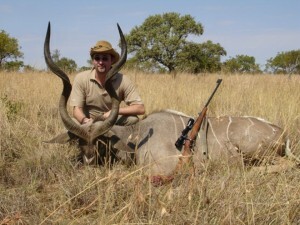 Luc Escoute: We offer exclusively the approach and lookout hunting for medium and big game hunts. In order to “vary the pleasures”, during the week, we also offer the hunt-what-you-see way for Hare (there are many present on the territory) and the “raised-rear” for the Guinea fowl, goose of Egypt and, in some seasons, for partridge. Inwent-Iij: What is it that best characterizes your hunting and your organization? Luc Escoute: Despite the size of our territory, we want to remain a ‘small’ hunt, focusing on quality and a family atmosphere rather than engaging in intensive seasons. We are very attached to an image of hunting that is ethical and sporting. Many Territories in southern Africa ‘fill’ their domain of game in pre-season for the sole purpose of ‘selling’ during the year to a larger number of hunters. This is not our vision. We prefer to ‘work’ with the natural growth of our populations and limit introductions. Similarly, we do not introduce exotic species, and prefer game specific to the region of the Eastern Cape. Finally, we wish to preserve our ecosystems more comprehensively and authenticly as possible, including flora, birds and specific insects, and not make Koedoeskop a zoo! 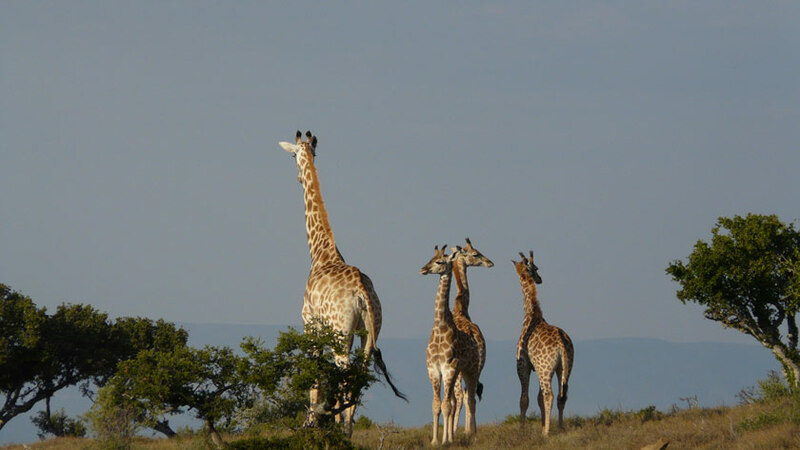 In addition to the “huntable” species, there can be seen on our territory a large number of giraffes and the famous mountain zebras (or Cape zebras), strictly protected species of which there are more than a few thousand individuals. Birdwatchers will also be satisfied… we have more than 200 species of birds including a large number of raptors, of which a resident couple of Verreaux Eagles. We cater primarily to a European clientelle, French and Belgian in particular, while most of the territories of South Africa and Namibia are ‘calibrated’ around the specifics of the North American, the largest customer, where quantity is often more important than the perception and experience of a land-friendly hunting. Finally, we strive to accommodate the hunters’ families when they require. We have a large number of activities to introduce the children and teens to African wildlife, hunting and stalking. Clay pigeon shooting and bow shooting are available on-site, as well as mountain biking and riding for the accompanying persons. Our field is very broad and quite mountainous, which allows us to ‘partition’ the domain in order to manage safely 2 groups of hunting and/or accompany children and families on safari or hiking, at the same time. 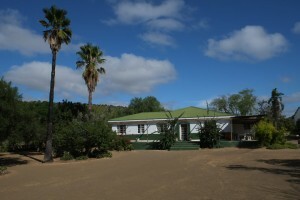 We welcome, very comfortably, hunters and their companions to the historic Koedoeskop farm, with adjoining swimming pool. Inwent-Iij: Do you also organize tourist stays? Do you combine the two? Luc Escoute: Yes, quite so. We are not only a hunting field! We have the advantage of being only a few kilometers away from Addo the Elephant National park, one of the largest in Africa, where a large number of the ‘big five’ are observable, especially elephants and buffaloes. The coast, only 2 hour drive away, offers fantastic fishing spots and even to surf (Jeffreys Bay). Around Koedoeskop, cultural sites and heritage cities, such as Graaff-Reinet, are very numerous because we are in the historic ‘triangle’ of the first waves of settlement by Europeans settlers/farmers, including Huguenots, in mid-18th century. We can perfectly combine hunting and tourist stay and encourage you to do so as the region is beautiful. 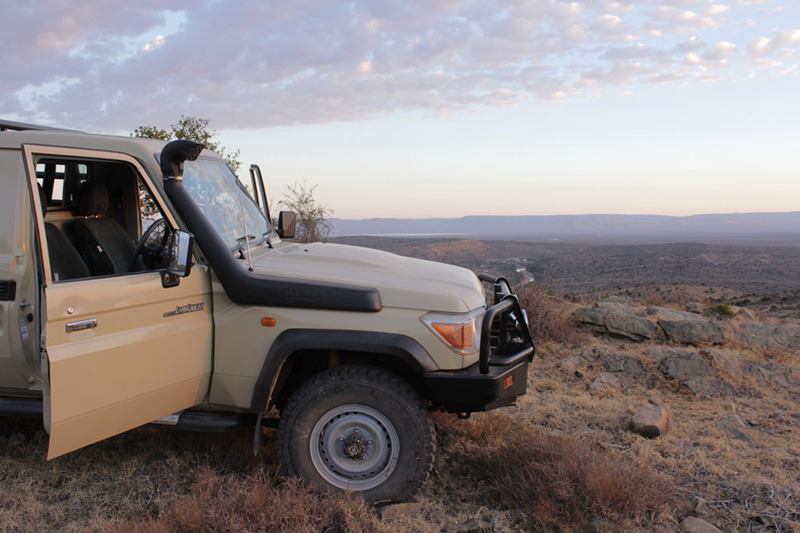 Nearby excursions are made with our own 4×4 vehicles and drivers/rangers for which we charge only a price per kilometer. Our visitors have thus no need to rent a car because we pick them up from Port Elizabeth Airport and bring them back there at the end of their stay. Inwent-Iij: Do you have the dates of stays for 2015 to offer to our readers? Luc Escoute: The hunting season extends from March to November, corresponding to the fall and the southern winter. The months of July and August are the coldest with temperatures around 5 degrees (Celsius) at night, sometimes less, but the day is sunny with temperatures around 15-20°. This “heart of winter” is a period that, personally, I appreciate much with its dinners by the fire and late sunrises! Only problem, the days are shorter. For stays with children and companions, the best months are certainly April/May and October/November. Each season has its charm, it rains little in our region (350mm per year) and we therefore enjoy 300 days of sunshine per year.